At the brink of extinction, the Helsinki HiFi show raised from the ashes and with slightly over 4000 visitors during two days, showed some positive signs of life about Finnish audio culture. Two-channel audio is doing just fine, and big thanks go -- again -- to Finnish speaker manufacturers. But imports are also proliferating. The number of well-known international brands available is on a rising slope and for our thin population density, is not bad at all. 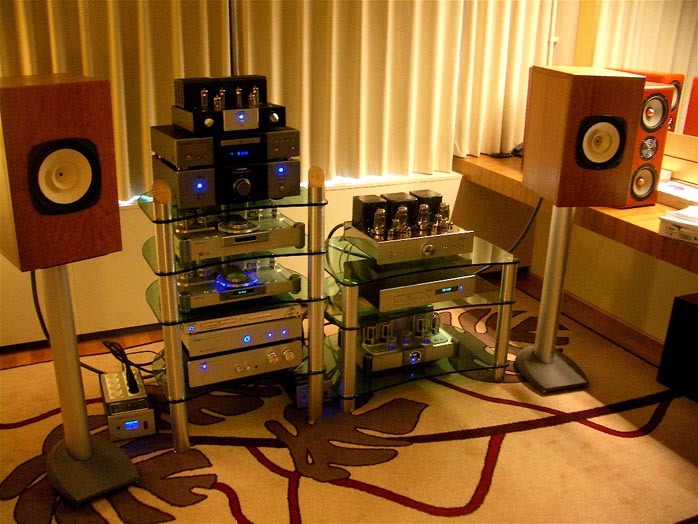 Amphion, Gradient and Penaudio, the three major players, came up with new speaker model/s each. The most surprising of all must have been Gradient's new 1.5 above, showing with MacIntosh electronics. This speaker got and will get loads of attention, believe me - and not just for its looks but unconventional yet carefully considered design. It's a completely new creation by Jorma Salmi, combining the virtues of the Gradient Revolutions (dipole bass, resistive loading for the midrange etc) with the spirit and design of the original 1.3. The new CEO Topi Lintukangas has renewed the company's image and the 1.5 is an elegant manifestation of the trend. 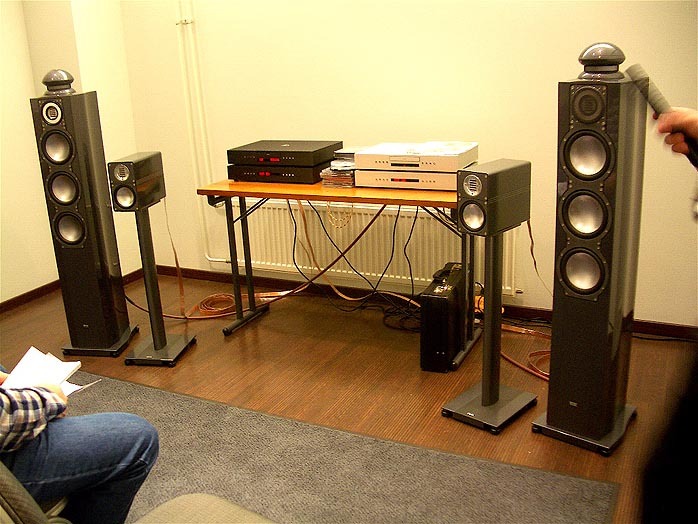 In 2006, Amphion hired Ole Lund Christensen from Denmark (who earlier worked for Gamut) to refine existing functional solutions into successful commercial products. The fruit of this cooperation is a new speaker called Amphion Prio. The Prio was already present at the Munich Highend 2007 but in Helsinki was shown in final form and function [future review in these pages planned - Ed.]. Another Amphion novelty was the Ion L, an advanced version of the Amphion Ion that just received The Absolute Sound 2007 Editor's Choice Award. Penaudio and its head designer Sami Penttilä keep on insisting that sophisticated and natural sound need not be incompatible with outstanding looks as exemplified by the new Ambient Series of speakers, the Chronos and Rogue models. The pervasive-sounding Chronos has to be seen in person in order to appreciate its awesome looks. 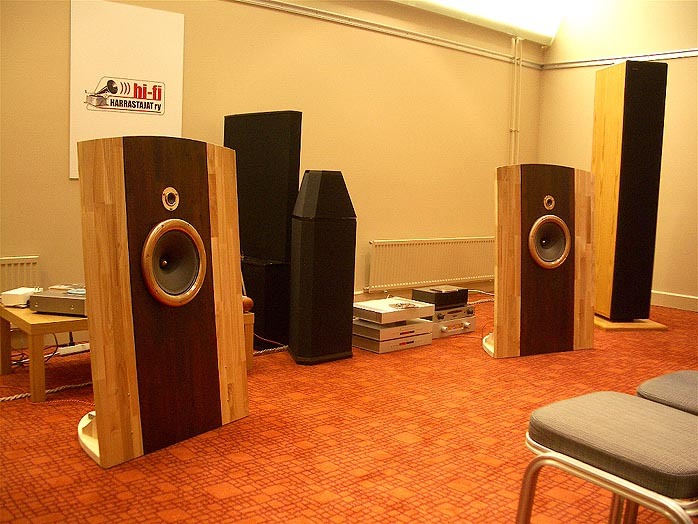 Other Finnish speaker brands present at the show included Aurelia [above], WaveDynamics, ForVoice, Harrin kaiutin and OR. 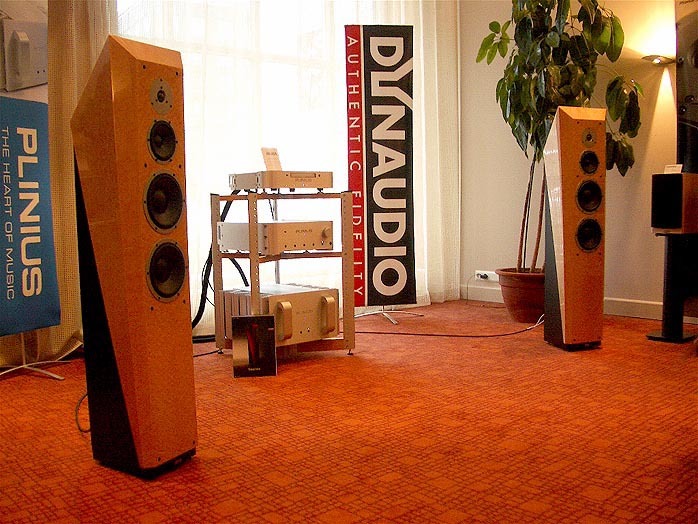 According to their designer, the Aurelias were not yet in their final production form but it was clear, by ear and sight, that the speaker swears by what many Finnish speakers insist on, namely controlled directivity. Two models are currently available but more will follow. 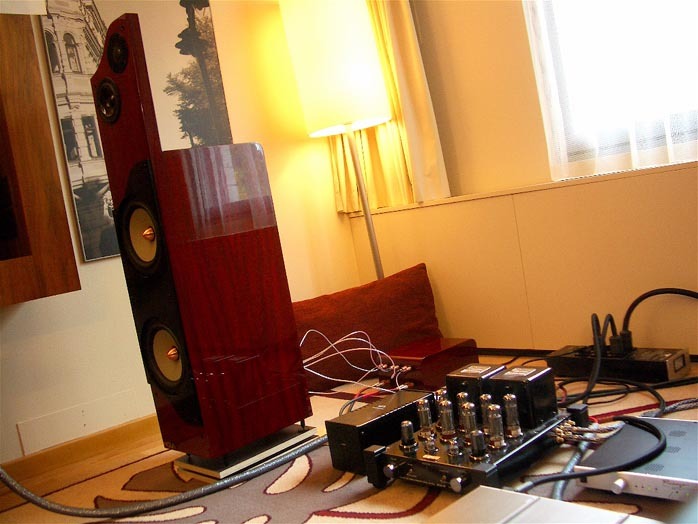 WaveDynamics builds speakers around the 3" Tangband wide-bandwidth element. 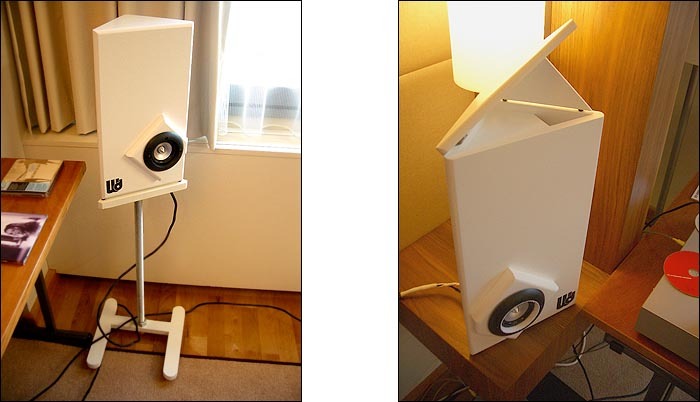 The WD speakers are meant to be placed near the wall or in the corner, with the shape and asymmetric position of the driver designed such that the rear wave causes minimum distraction and interference from such placement. 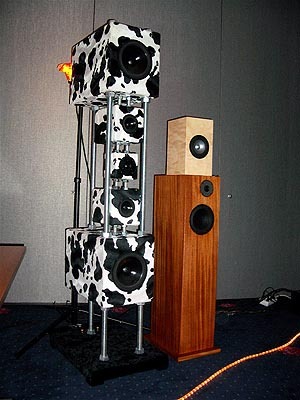 The speakers have a very intriguing sound and don't look bad either. WD's tiny transmission line is the most elegant TL I've ever seen. ForVoice 7.7 is a new, smooth and openly sounding two-way (SEAS coaxial) while OR is already a 40-year old company better known in its homeland than abroad. 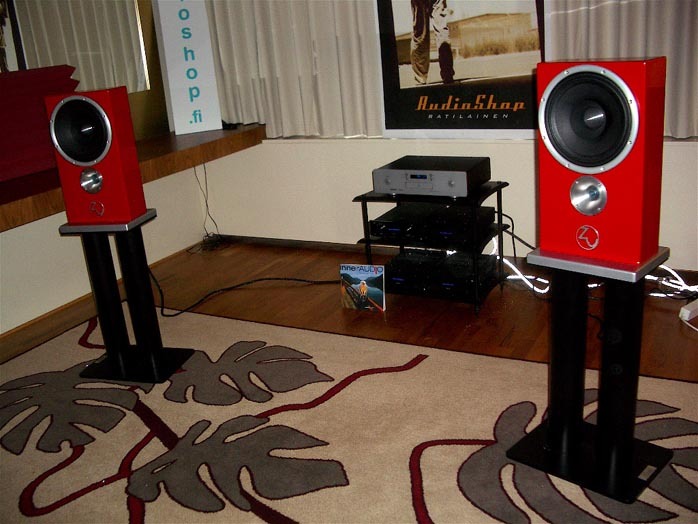 OR proudly demoed its new E1, a 2-way with a horn around its 27mm dome tweeter and a high-quality leather surface. Active speakers have always been fairly popular in Finland thanks to Genelec, perhaps the most well-known Finnish pro speaker manufacturer abroad. 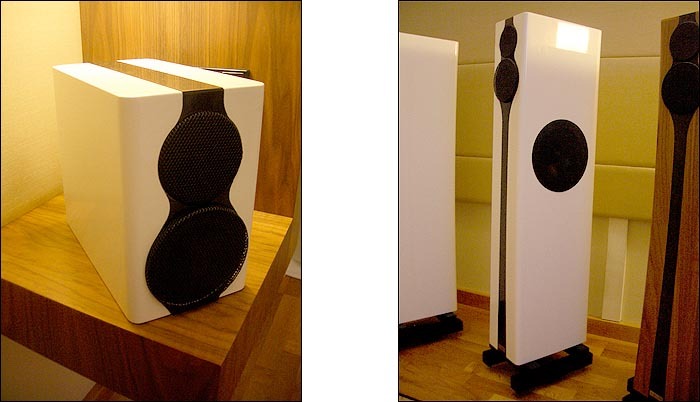 Apart from Genelec and Profel, another Finnish pro-speaker firm, the British active speaker specialist PMC made its first appearance on these shores. 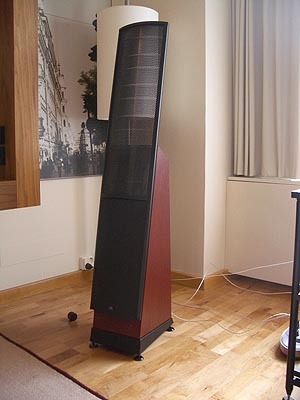 Martin Logan too had gone active with its new Purity, a model with a 200-watt class D internal amplifier. 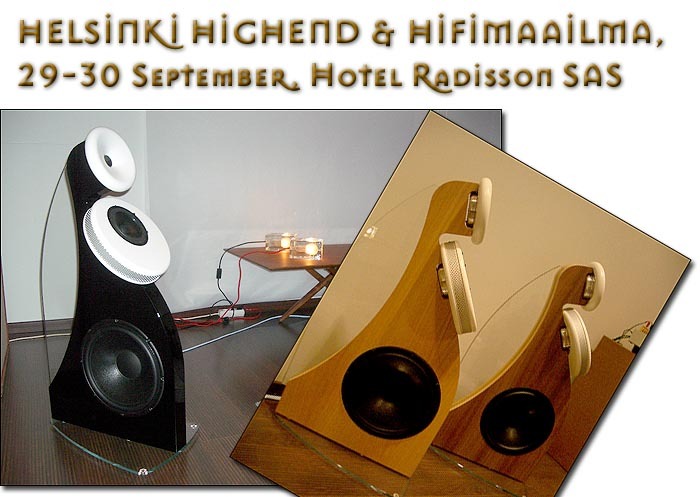 The speaker pair in Helsinki was an upgraded version of the one presented at Munich in May. 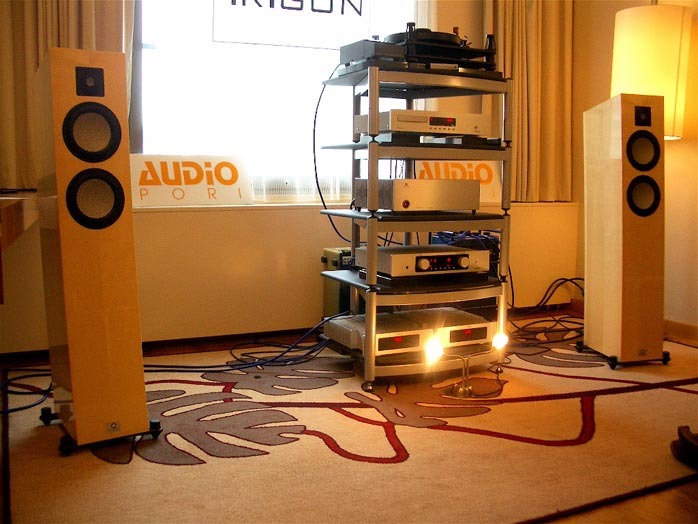 AudioPori had set up a very appealing system of Swedish Marten Miles speakers with a full set of Trigon electronics. This was one of the best Marten demos I've heard: fast, brilliant and shining yet without (immediate) signs of listening fatigue artefacts. In another room by Audio Ratilainen, the mighty Marten Birds took to the same notes but added a few decibels of warmth and authority to the tone. The quality of the performance was obvious. 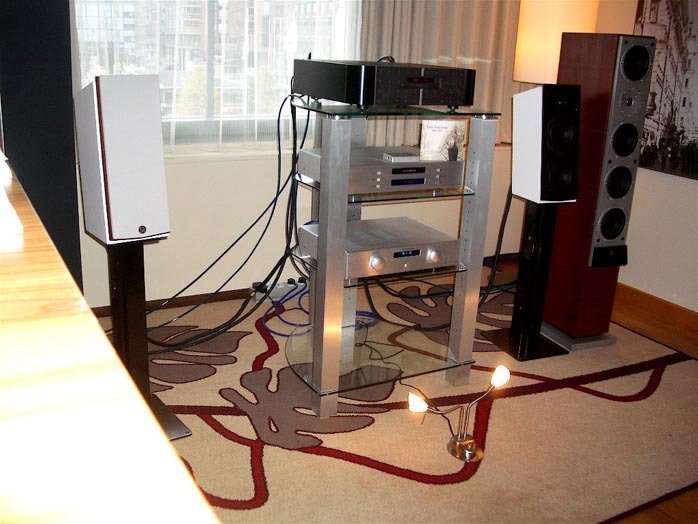 Danish speaker manufacturer System Audio was represented in several rooms. 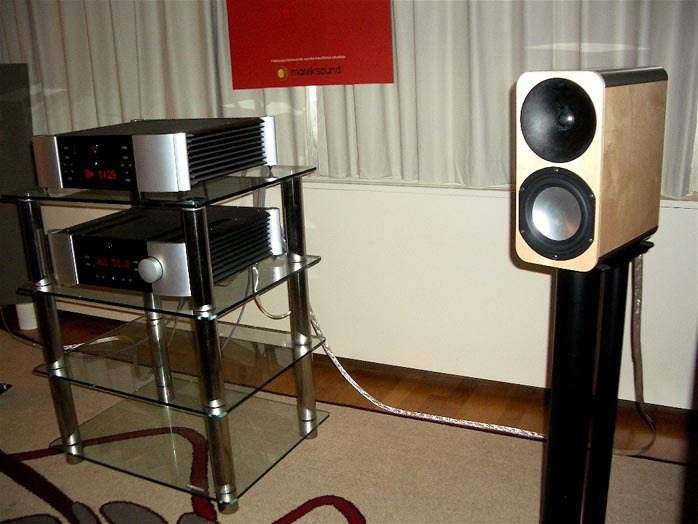 The slim SA Ranger produced a big, full sound while the new small SA Comet played music with the help of Consonance electronics. All in all and sound wise, the show had very few complete failures - or I just completely failed to hear them. On the flip side, there were quite a few promising systems such as the Wharfdale Opus 3M2 with Consonance; the NEAT Acoustics Motive II with Exposure; the Dali Helicon 300 with Electrocompaniet; the Tannoy Kensington with Denon and Thorens; the Elacs with Densen [below]; and so forth. Here are some further pictures of fine-sounding systems: The first is Dynaudio's new Anniversary speaker, the Sapphire, with a complete Plinius system. 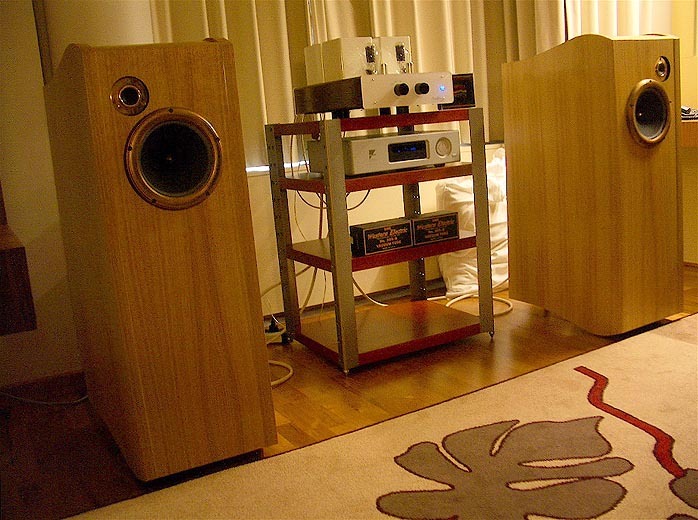 And the Nola Viper Reference hooked to a Master Sound 845 amp (not in the pic), Reimyo transport + DAC for source. Hobbyists were not forgotten either. Audiopoli is a group of students at the Helsinki University of Technology. They currently have three speaker projects [see left]. 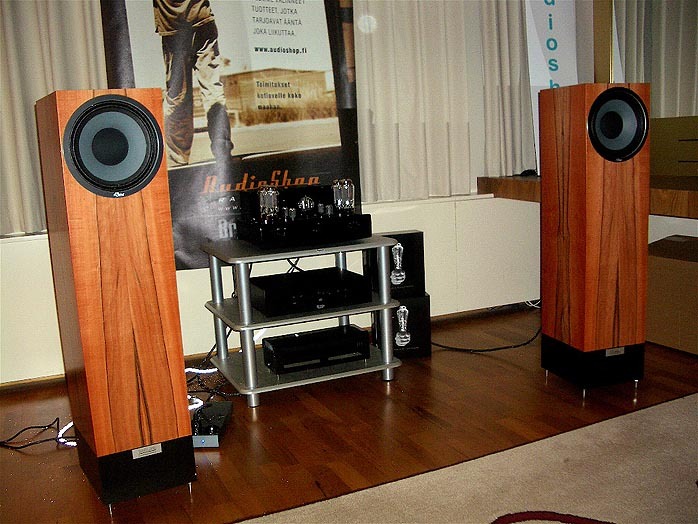 Hifiharrastajat, another club of hifi enthusiasts, dragged three systems to a big room, one with massive Dunlavy 4As, another with delicate sounding PHY-HP-based baffles. 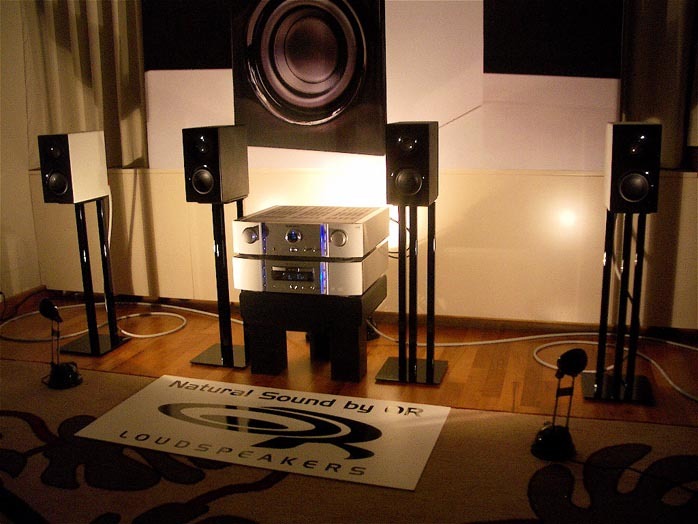 The third was a MS system in which one speaker (Gradient Revolution) is placed in the middle for the mono signal and a dipole speaker (Quad ESL 62) right behind it at 90 degrees for the difference signal (+/-). The system creates an airy and spacious sound, not too dissimilar to the best omnidirectional speakers, i.e. a sound that is particularly good for e.g. orchestral music [echoes the Layered Sound ideas just described in our Podium Sound Model One review - Ed].